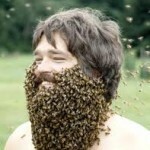 I long for the days of bee-beards. It’s no secret that honeybees have been struggling with their assigned duties of late. Articles abound with speculation for the reasons why. Beekeeping (especially urban) has been ~1.57×10^7 K-hot for the last five years or so and doesn’t show any sign of decline, unlike the weak-sauce hipsters who are presently abandoning their chickens. Despite all of that, the bees still need our help, so it’s time for you to get out there and start pollinating! People will surely notice you outside your studio apartment or permicultural landscape with your handmade organic free-range horse-hair pollinating brushes with reclaimed-willow shaft, meticulously impregnating each ovule with the pollen generated by the stamen of neighboring flora. Don’t just get the obvious stuff like apple trees and heirloom cucumbers that your friend Theo planted in your would-be lawn, if you weren’t aggressively scything. Never exclude noxious weeds or other “unwanteds” as you do god’s … err … the bee’s work. Every species must survive, even if it does happen to be a “non-native invader.” You’re an equal-opportunity pollinator, just like the bees. Pay no attention to the onlookers. You’ll need to focus on encouraging buzzing sounds to coax flower-love as you do your delicate work. After the entire neighborhood has received a thorough pollinating in 37 hours or so, there will be plenty of time to answer questions over at the artisan coffee shop, which you’ll love. You can talk at length about the how the specific breed of horse hair you’ve chosen more accurately emulates the proboscis of would-be pollinators. “I just think we all need to work together and DO something,” you can announce proudly as the googly-eyed observers admire your pollinating instrument. “I personally think it’s the overuse of neonicotinoids in our non-organic food culture that is killing them,” you’ll deliver solemnly as you examine the remaining pollen from your last efforts to successfully fruit stinging nettles. Be sure to pick up Honeybee: Lessons from an Accidental Beekeeper , and make sure several people see you reading it on some sort of public transportation before you get to it later this week. 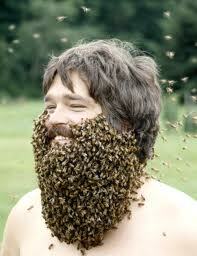 Godspeed, proud hominid worker bees. The world needs you, even if you don’t fully understand why.